At long last, here is the tutorial on Entrelac! Below you will find a printable guide, with which you can knit a small sample of entrelac fabric, as well as a free pattern for my Annabelle Entrelac Wrap. 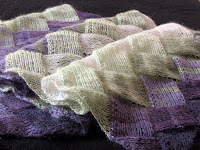 When you feel comfortable with entrelac, you can use the directions here to create your own project. 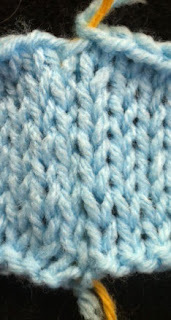 Just substitute the number of stitches in the sample for however many stitches you want to use. 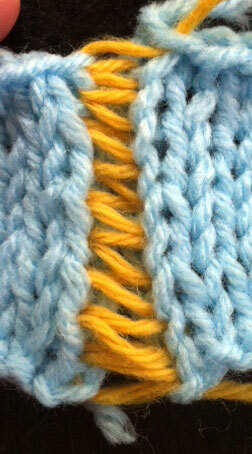 There is also a video demonstrating the small sample you can knit with the entrelac guide. The video is in two parts, each about half an hour long. I show the sample knit from cast on to bind off - how to knit the base or foundation triangles, the right side triangles/rectangles, the left triangles and wrong side rectangles, and finally the bind off triangles. This tutorial is for knitting entrelac flat. I also have a tutorial for Seamless Entrelac / Entrelac in the Round HERE. I have recently started redoing all of my old videos. Bobbles is one of those videos. It was long and extremely boring, on top of being pretty hard to see. This new video is still a tad on the long side, but at least now it is very clear! And instead of written instructions scrolling through the video, I am putting them up here. Hope everyone likes the new bobble video! There are no set rules for bobbles, really. You can make as many as you want, big or small, different colors (as in the photo above), and they can be placed anywhere you like. If you are following a pattern, it will undoubtedly tell you where to place the bobbles, and how to make them. Below are a few ways I know to make bobbles, and I am sure there are more methods floating around out there. They all have a slightly different look, but the method of making them is really the same : increase into the next stitch, turn and purl, turn and knit, decrease. And there is your bobble. The typical bobble is 5 stitches, but you are free to experiment. The video demonstrates stockinette fabric and bobbles, but you can really do anything with them. Maybe garter fabric with a stockinette bobble, or the other way around. Why not a seed stitch bobble? Use bobbles as buttons. Your only limitation is your imagination. Then, turn your work and purl those same five stitches. Turn again and knit. You can stop here, or purl/knit again. The more times you do this, the puffier your bobble will be. 4) Once you have purled/knit as many times as you like, continue knitting to the end of your row. You will make your decreases on the wrong side of the fabric. 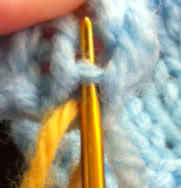 When you come to the bobble, simply purl all of the extra stitches together. Obviously, this could become difficult if you have chosen to use more than five stitches for your bobble. I wouldn't recommend this decrease for more than five stitches. And of course, here is the video! Happy Knitting and Enjoy! Hi everyone! 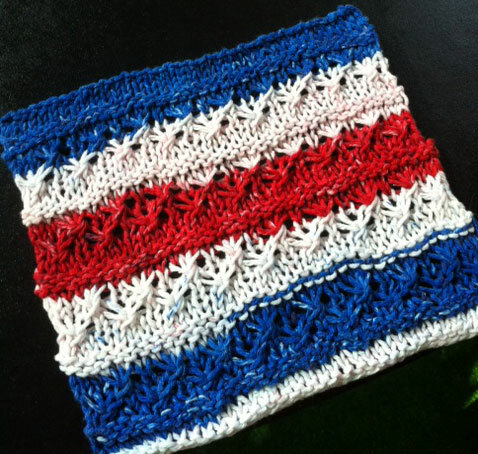 Here is a free pattern for you to knit for the Fourth of July, which is right around the corner. This uses Lily Sugar n Cream self striping yarn, so all you have to do is knit. 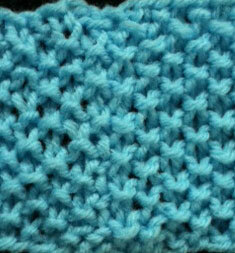 The stitches you need to know for this pattern are: knit, purl, yarn over, purl three together. If you don't know how to do the star stitch, I have a free video HERE. June 20, 2012 - I used my cloth for the first time tonight, and the red has bled a little bit into the white. There is also a little bit of bleeding from the blue, but not much. This doesn't bother me, but I wanted to let everyone else know in case it may be an issue. Hi everyone! Thought I would do a little video to show you some of the knitting goodies I have gotten lately, and of course the magazines I have waiting to be read. Also a couple of projects that I am working on right now, both of which I plan to do tutorials on and offer free patterns. All of the magazines I show you have a link up in the Magazine Tab at the top of the blog, if you are interested in subscribing or buying single issues, both current and back issues. Today is the last day for the Interweave Hurt Book Sale. I got some great deals on a few books, and none of them were hurt in any way. Not that I would mind if they were a bit hurt, it's going to happen any how :0) If you miss the sale this time around, I am sure they will do it again next year. It really is a chance to get amazing deals on a lot of different books - ebooks are available also! I grabbed four hanks of Madelinetosh Tosh Merino DK Onsies from Jimmy Beans. I got two each of Dusk and Rose. I plan to use these for a top down shawl. I love Madelinetosh yarn! Nice and soft and very easy to work with, and it has great stitch definition. I used Madelinetosh yarn in my Star Struck Hat pattern that was part of the tutorial on converting stitch patterns to use in the round. And, from one of, if not THE best online yarn shop, Knitty Noddy, I got the new addi Long Tip Lace Clicks, along with some Hand Maiden Silk Maiden yarn. A yummy blend of 50/50 silk and wool. Very nice and soft, and the colors are beautiful. And the projects I am working on - two wraps. One is done in the scribble lace or scribble knitting technique, and the other is an entrelac wrap. So, tutorials on both and free patterns. Those will be up as soon as I finish knitting. Close to being done on both! I think that about covers it. Until next time, Happy Knitting! If you want to add a little glitz to your tassels, why not use beads? It is really simple to do - the process is basically the same as making regular tassels, but you don't cut the bottom of the tassel. Just pick some beads appropriate for your yarn. If you aren't able to find beads that will fit your yarn, try using a complimentary, light weight yarn that the beads will fit on and wrap it along with the yarn used for the project. Or you can just use the different yarn by itself. Like regular tassels, you will need something to wrap your yarn around that is the length you want the tassel to be. You also need beads of course, and scissors. You will also need a needle that will fit through the hole in your bead with the yarn, or you can use a crochet hook to put the beads onto your yarn like I do in the video. You can use as many beads as you like. For the tassel above, I just kept one bead per strand as I wrapped. Once you are done wrapping, cut the yarn. 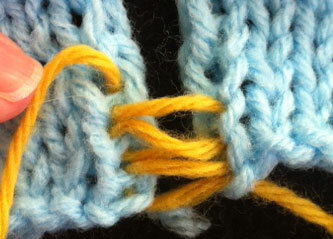 You will need to cut another length of yarn to tie the tassel at the top so it doesn't fall apart. Then, just slid the tassel off the cardboard or whatever you wrapped it around. Do not cut the bottom of the tassel or your beads will come off. You can then tie another piece of yarn around the top of the tassel if you like. Attach the tassel to your project and trim any ends that may be sticking out. Here is a video showing how I made the tassel above. If you plan to make a lot of Pom Poms, then you will probably want to invest in some of the hard plastic pom pom makers you find in the craft stores. They are easy to use and come in all different sizes. I find the instructions that come with Clover's tool a bit lacking, so here is a video. If you only want to make a pom pom here and there, then it really isn't necessary to purchase a pom pom maker. All you need to make your own pom pom maker is some cardboard, a pen or pencil, and two circular objects. One should be a bit smaller than the other. The size of your circle determines the size of your pom pom. And you need scissors, of course. With the larger circle, trace two circles on the cardboard. Then, place the smaller circle in the middle of the larger one, and trace it. Cut out each circle using the line of the larger circle. Then, cut straight up to the line of the smaller circle, and cut that out as well. Finally, all you have to do is place the pieces of cardboard on top of each other, making sure the straight cuts line up. Wrap your yarn around the forms until they are covered. The straight cut you made will allow you to easily wrap the yarn around the cardboard. The more yarn you use, the fluffier your pom pom will be. When you are done winding, cut the yarn. You will then need to cut a length of yarn to tie your pom pom together. But before you can tie it all together, you need to cut it. Make sure your scissors are sharp, and stick them in between the cardboard and cut all the way around. Once all of the yarn has been cut, slip the length of yarn between the pieces of cardboard and tie a couple of tight knots. Remove the cardboard and you have a pom pom ! Trim it up a bit if necessary. Use the strands you used to tie the pom pom to attach it to hats, scarves or whatever you like. You could use a plastic lid (from a coffee can, etc.) 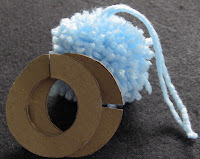 to make your pom pom forms if you want something a bit more sturdy than cardboard. 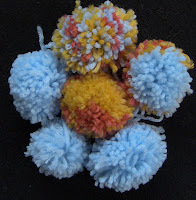 And here is a video on home made pom pom making. 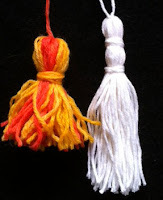 Tassel on the left was made with some wool yarn I dyed myself. Tassel on the right was made with Sugar n Cream cotton yarn. Tassels are easy to make. You don't need any fancy equipment, either. To keep things brief here, I am not going to go into great written detail. 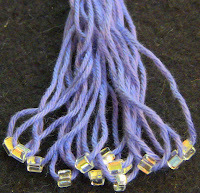 Not that it is complicated to make a tassel, but it is much easier to see it being done than read how to do it. Basically, all you do is wrap your yarn around the cardboard, until the tassel is as thick as you want it. The more wraps you do, the thicker your tassel will be. Then, cut a length of yarn, slip your crochet hook under the wraps, pull the length of yarn under them, and tie it a couple of times tightly so that the tassel doesn't come apart. These are the strands you will use to attach the tassel to your project. Next, cut the wraps on the opposite end from where you tied them together. The tassel can be used as is, or you can cut another length of yarn, and tie it around the tassel a short distance from the top. You can see in the picture above where I have tied my tassels. I like to wrap my yarn a few times around the tassel, but you can just tie and be done. With your crochet hook, pull the tails from the yarn you used to tie around the tassel underneath itself and voila. Trim if necessary. To attach your tassel to a hat or scarf, or whatever you like, just use the strands from the top of the tassel to tie them on. That's it. So, here is the video. Happy Tasseling!